Please excuse the inconvenience during construction and landscaping this summer. Visit construction page for site photos over the past year. Ojibway's weather is now available anytime on the Internet at two locations: Current Weather at Weatherlink and a more comprehensive report at Weather Underground. If you find a turtle wandering far from water at this time of year chances are it is a female looking for a sunny spot to lay eggs. 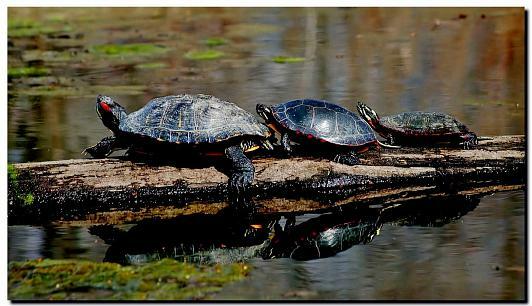 Male and female Painted Turtles can be separated by the length of their front claws. Males have much longer claws on their front legs than on their rear legs. Females have the same size nails on all four limbs. Friday, June 1: Ojibway's naturalist, Paul Pratt, and Tom Hince set a new Big Day birding record for Canada on June 1. They recorded 218 species along a route from Cold Lake, Alberta to Waterton Lakes National Park. Millions of mayflies (Ephemeroptera) emerge along the Lake Erie and Lake St. Clair shorelines in mid June. In Windsor, the Lakeview Marina is a good place to observe the clouds of mayflies under lights each night. The return of these huge numbers are a sign of the improved condition of the Great Lakes. Thursday, June 23: The first of two Peregrine Falcon chicks fledged on June 22. The nest site is on the upper ledge of the huge cement support of the Ambassador Bridge and is visible from University Ave.